Back in March, I wrote about my judging experience for last year’s Ku Sang Young Writer’s Award, and as it happens, I was lucky enough to be invited to participate again this year. The 2016 crop only consisted of three books, though, and I’d already read and reviewed one of them (Chang Kangmyoung’s Fired) both here at the blog and for Storytelling ASIA – meaning I just had to read two short stories and choose my favourite. Not a particularly onerous task, I’m sure you’ll agree! 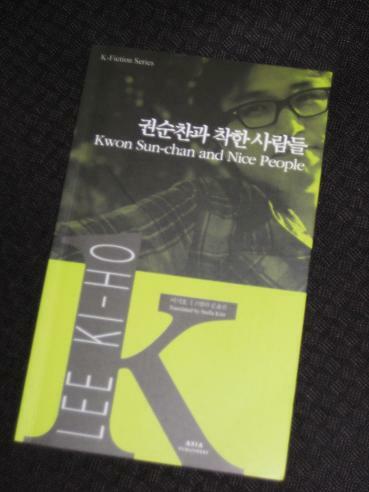 First up is Lee Ki-ho’s Kwon Sun-chan and Nice People (translated by Stella Kim, review copy from ASIA Publishers). The story is told by a university lecturer and writer who spends his days driving between his suburban flat and his workplace. A typically depressed Korean drudge, he commutes to Seoul to see his family every couple of weeks, wondering how his life has ended up like this. Mr. Kim Seok-man from Apartment Building 103, Number 502 should give me back my seven thousand dollars! Ripped off by a loan shark who took a double payment from himself and his now deceased mother, Kwon Sun-chan is making a silent protest outside the man’s registered address. The problem is that the wrongdoer doesn’t actually live there (he’s just used his mother’s flat as his legal address), so Kwon prepares to hang around, believing that he’ll show up at some point. The other residents are initially sympathetic, but gradually their feelings turn, particularly when the man refuses their offers of support. If he doesn’t want any help, financial or otherwise, why won’t he just go away and leave them in peace? Lee is the writer of the satirical novel At Least We Can Apologize, and this story revolves around a similarly inventive idea, albeit told in a slightly more sombre tone. The key feeling here is of frustration, whether that of the writer stuck in his daily grind or of the residents who are unable to get rid of Kwon. Even the background details, such as a hunger strike by the father of a dead child that the writer hears about on the news, come together to enhance this feeling of a society fed up with its lot. 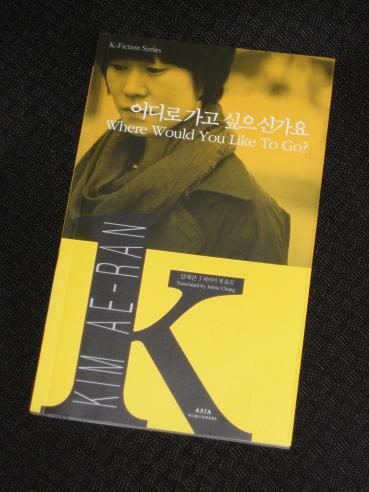 The second piece, Kim Ae-ran’s Where Would You Like to Go? (translated by Jamie Chang), is a more personal story, which is also concerned with wider societal issues. Myeongji, a woman in her thirties, travels to Edinburgh to spend a month house-sitting for her cousin, but there’s a deeper meaning to her visit. She needs some time to herself as she’s recovering from the tragic death of her husband and thinks the time away from home will do her good. I didn’t spend time sparingly or wastefully in Edinburgh. I let it flow, like pouring rice water down the drain. The current was just so, that it would not let me sink or sweep me away. I didn’t do any sightseeing, read the paper, or take pictures. I did not make friends, turn the TV on, or go for a run. When someone from Korea called, I replied via text or email. Sometimes not even that. Where Would You Like to Go? is a beautiful story, another great piece by a writer whose ‘The Future of Silence’ was easily my favourite story of the anthology of the same name. She’s definitely a writer I’d like to see championed in English, so if anyone’s reading this… The story works on many levels, with the time in Edinburgh nicely interspersed with flashbacks to what she was doing on the day her husband died, her clumsy first attempt to make kimchi interrupted forever by a fateful phone call. And yet, the story is actually examining a nationwide tragedy in its focus on the individual. There’s no mention of it anywhere in the text, or in the excellent writer’s notes, but Kim’s passing comment of ‘April last year’ is enough to give the game away. The background to Where Do You Want to Go? is the the Sewol ferry disaster, where over three hundred people (many of them schoolkids) died, and Myeongji’s husband’s tragic death comes when he tries to save a student. The focus on one victim, once removed, makes for a powerful examination of the tragedy. My favourite story of the three was Where Would You Like to Go?. While the other two stories were fairly standard tales of the unfairness prevalent in Korean society, this one worked on several levels and showed greater sophistication in many areas. A story of a woman trying to come to terms with a tragic loss, it cleverly uses the idea of grief manifesting itself physically, meaning the protagonist must face up to her loss before she can carry on with her life. 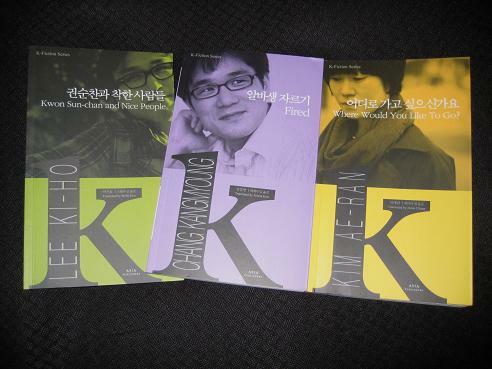 I have read two of the three, Chang Kangmyoung’s “Fired” and Kim Ae-ran’s “Where Would You Like to Go?” I haven’t read Kwon Sun-chan and Nice People although I did enjoy his At Least We Can Apologise. Based on the two I’ve read plus my experience of Lee Ki-ho’s work I would tend to agree with your, and the overall judges’ call – Kim Ae-ran’s is poetic and moving. I did have a couple of issues with the translations though, more I suspect down to editors than the translators themselves. Where Would You Like to Go? generally reads very naturally in English but that only makes the odd bizarre line all the more jarring e.g. “that was also the day you stopped smoking cold turkey” (needs an “and went” inserted or indeed simply omit the cold turkey as the Korean original just says “quit smoking”) and another line “The intended gone, the uninspired, everyday words I said hung around my lips with nowhere to go” where the first three words make little sense. And Fired uses the McCune-Reischauer system to turn Korean hangeul letters into Western ones, which while perhaps phonetically accurate always seems pointless to me since it uses non standard Latin characters (dipthongs) and so rather defeats the whole point. Ah OK – to me you quit X and go cold turkey but don’t quit cold turkey. I do wish generally there were more books translated into English rather than American! The initial books in the series did seem to have poorer translations (one got the impression they weren’t too fussy who they picked) and also had a habit of picking books that had already been translated elsewhere, but the newer ones are a great improvement. Agreed. The best translators of literary fiction are usually native speakers of the target language rather than the source (of course, ideal would be native fluency in both).